Gotham Steel is a brand from Emson, a family-owned business that has specialized for 70 years in inventing and distributing quality consumer products. Emson works with 6 celebrity Chefs including; Daniel Green, Josh Capon and Graham Elliot to create a truly distinctive ceramic cookware line. Gotham Steel holds customer health and safety as top priority, and all products are kept free of dangerous chemicals and polymers. You can have peace of mind while enjoying the great cooking experience these products deliver. 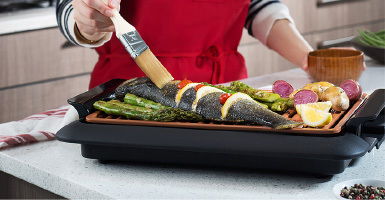 Gotham Steel products feature a truly unique titanium-ceramic or Ti-Cerama finish that blends amazing durability with impressive nonstick qualities. 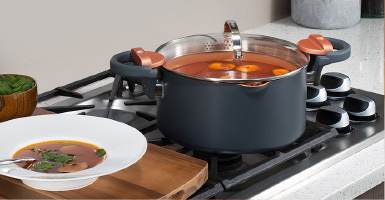 The titanium ensures that pots and pans are resistant to damage or scratching, even from metal utensils, while the infused ceramics create a truly nonstick cooking surface that doesn't require oil or butter. Preparing the perfect dish with minimum fuss has never been easier. Gotham Steel's durability means you can skip breaking out extra mixing bowls and prepare meals directly in the pan. The nonstick surface matches the best ceramic cookware on the market and allows flawless presentation without spills or scraping. Get your Gotham Steel products at London Drugs today and experience the difference. What is Gotham Steel made of? 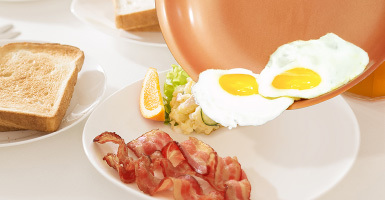 Gotham Steel pans are made of aluminum and copper and finished with Ti-Cerama technology, a unique blend of titanium and ceramics. They're nontoxic and certified free of synthetic polymers. All Gotham pans are PTFE/PFOA/PFOS Free. Are Gotham Steel lids and pans oven-safe? Yes. Gotham Steel lids and pans are oven-safe to 500 degrees Fahrenheit. Can Gotham Steel be used on glass-top stoves? Yes. The nonstick finish is safe for your glass-top stove. Are Gotham Steel lids and pans dishwasher-safe? Are Gotham Steel pans induction ready? Unfortunately, most Gotham Steel pans aren't recommended for induction stove-tops. Always read the instructions on your Gotham Steel cookware carefully for guidance on best use.